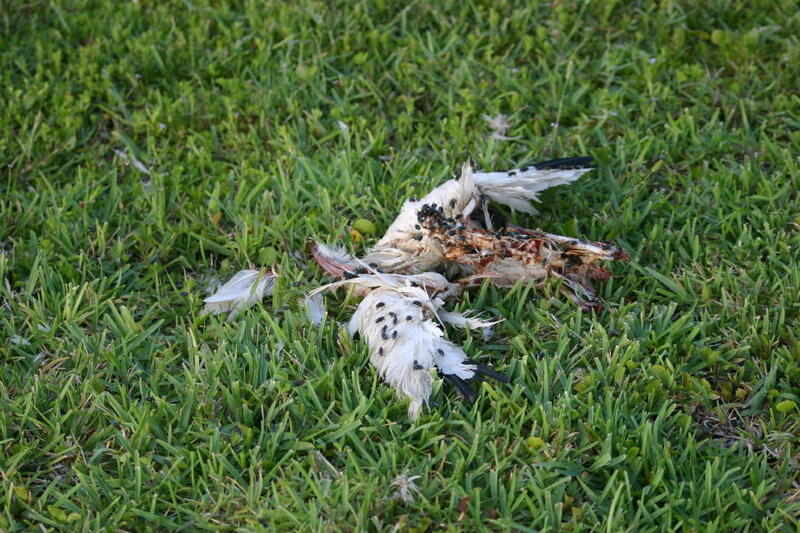 Yesterday morning I found a freshly dead adult White Ibis on our lawn, at the side of the lake. I did not think too much of it. 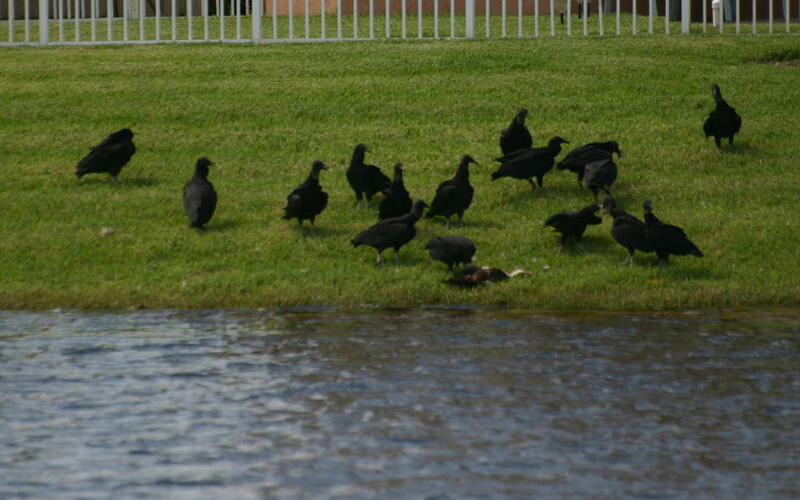 However, a little later, diagonally across the lake, I saw a large group of Black Vultures congregating around the carcass of a freshly dead Muscovy duck. A couple of them came over and finished off the ibis, leaving barely enough for the flies. briefly and approached another Muscovy that was sitting on the grass. pretty much crawled into the lake, where it began to thrash violently. property. 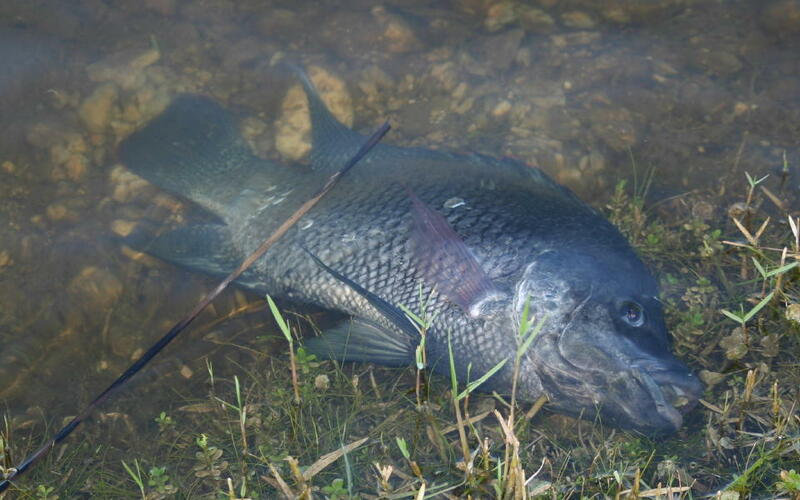 I walked over towards them and found the body of this 16 inch fish, probably a Blue Tilapia, at the water’s edge. Not a good sign. As dusk was approaching, I noted one of the two “sister” hens that had very similar coloring and facial patterns was out in the back yard, acting strangely. As I approached it, the bird appeared to have trouble balancing and holding its head up. It fell forward as it tried to walk away from me, its head dragging on the ground. It made it to the water, where it swam with its head submerged. Its “sister” swam close by. The sick duck tried to breathe every few seconds, flapping its wings to help it thrust its head above water as it gasped for air. Finally, it made its way back next to the shoreline, where it rested its head on the lake’s edge, not moving. It was touching to see its “sister” staying close by as the bird expired. Then there are disease organisms that affect the central nervous system. West Nile may cause encephalitis, while bird flu would be most unlikely. If I see any more evidence of illness I will call health officials. July 19th, 2007 at 10:53 am Botulism - call the health officials. 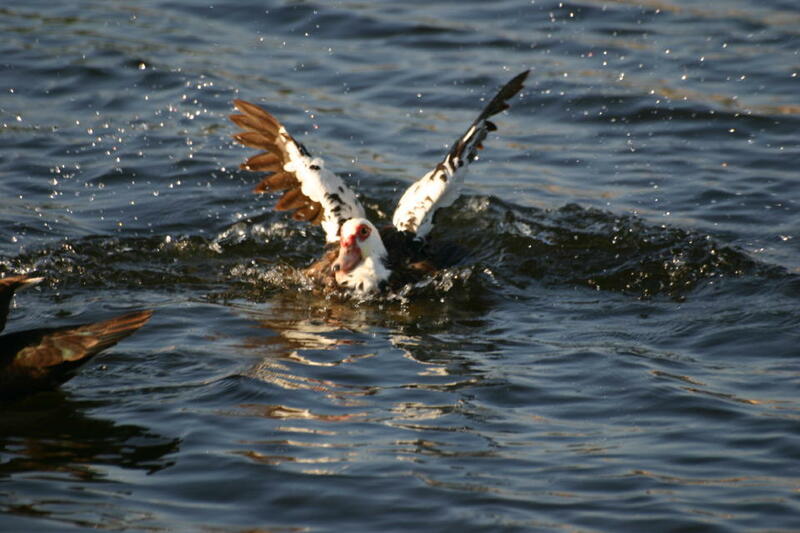 There’s a pond in Rio Rancho at golf course where this was happening, as I recall the waterfowl exhibited similar symptoms. July 20th, 2007 at 3:25 pm Ken, I was also going to suggest Botulism. It happened at a local lake here. Some residence were not happy with the abundance of muscovy ducks and decided the best course of action was to take the eggs from the nests and throw them into the lake! Not a good plan. I would recommend calling your local health or environmental officials. July 25th, 2007 at 8:43 pm On garbage collection days, the Muscovies and grackles attack any refuse that has been placed in open containers or flimsy bags, such as those from grocery stores. Once split open, the White Ibises join in the feast. 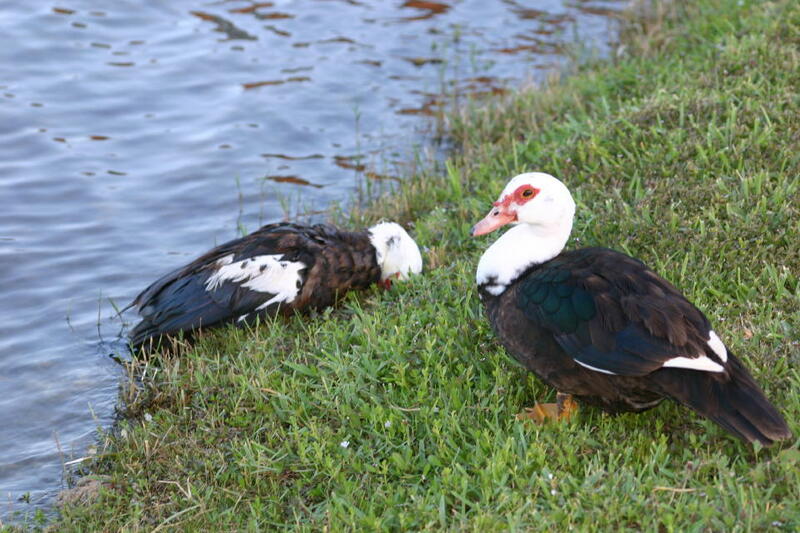 There may be as many as 5 or 6 ibises and 4 or 5 Muscovy Ducks competing for anything edible. I wonder whether the brief but dramatic kill that I witnessed earlier this month was perhaps due to the presence of a toxin in someone’s garbage. If it were something in the lake, it should have affected many more birds. Having said that, I must note that a second brood of a dozen ducklings that hatched out in our back yard has also disappeared before they were two days old. 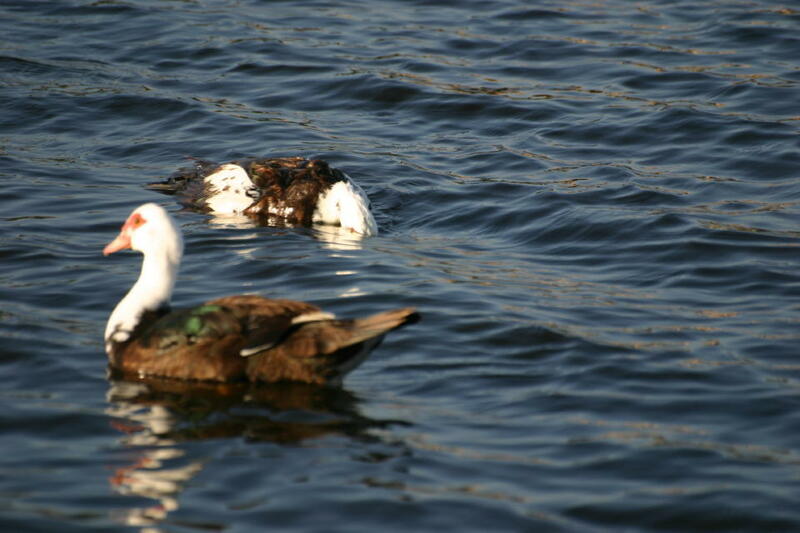 Further, the number of ducks appears considerably less, though the tough old “Alpha” males are still around. 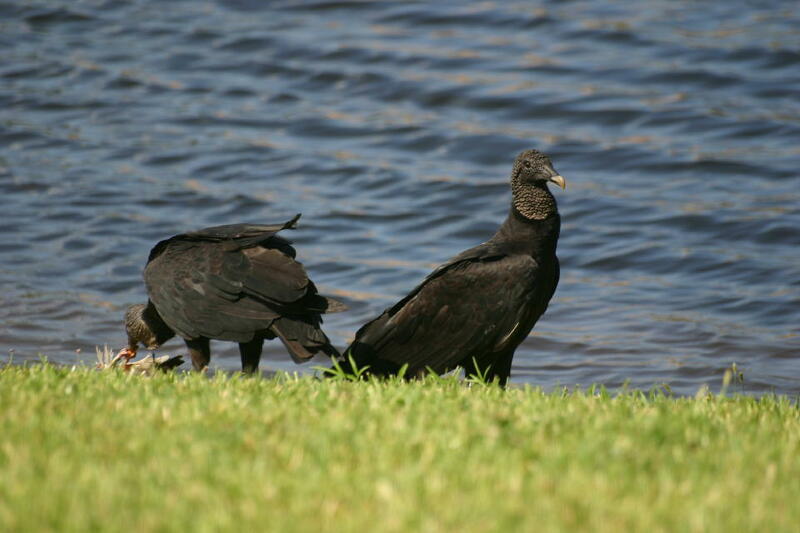 However, there have been no more lakeside carcasses and the vultures seem to have gone elsewhere to feast. December 2nd, 2007 at 6:30 am As a belated follow-up, the Muscovy die-off was much greater than the several carcasses on our property seemed to indicate. My estimate is that 80 to 90% of them perished, and only one brood of ducklings (maybe 4-5 individuals) has survived in the months since the kill. It very likely was a botulism outbreak, as Janine suggested earlier. Interestingly, this week we had a large numbers of fish die, attracting vultures and at least one Bald Eagle.